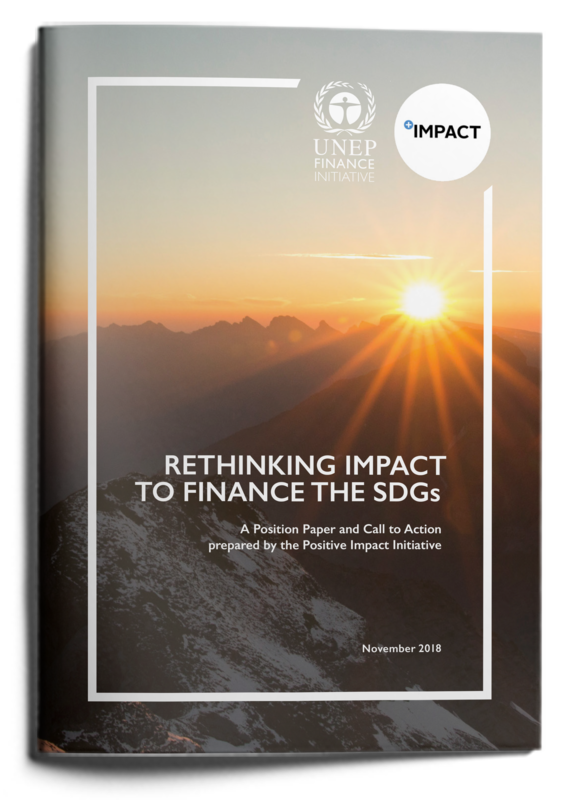 In Rethinking Impact to Finance the SDGs, we explore new ways to significantly decrease the cost of achieving the SDGs and stimulate business and financing solutions at scale. Social, economic and environmental impacts have an as-yet under explored potential to generate financial revenues: impact-based business models can be developed, with the delivery of positive impacts as a driver of sustainable business growth and long term enterprise value. This could be game-changing: by making it cheaper to deliver sustainability outcomes, less risky to finance and would stimulate the private sector to create new business solutions that focus on positive impacts. In fact, this shift to an impact-based economy is already under way, and the finance sector has a strategic interest in understanding impacts, not only to meet stakeholder needs, but also to capture new opportunities that support this transformation. Accordingly, it is critical for banks and investors to improve their capacity to understand and analyze impact. Rethinking Impact is not just be for financial institutions, but also for businesses, national and local public authorities, academia, civil society and everyday people. Only by working collaboratively across all stakeholder will the Global Goals be achieved. Watch the video of the launch event at UNEP FI’s Global Roundtable 2018.